The Dallas Stars announced this afternoon that Luke Gazdic was among two players signed today for the coming season. The left winger, who has played most of his pro career in Texas, was signed on a one year two-way deal. Gazdic was a restricted free agent and was without a qualifying offer coming into this afternoon's deadline. The fan favorite is definitely looking to make some noise with this coming season. He has become a trusted veteran voice in the locker room and earned the "A" on the ice several times during the season. He will be a trusted member of the bottom six for Willie Desjardins, but no question he is looking to make his impact felt in Dallas as well. There are still a lot of items to be hammered out in Big D with regard to their roster so there is still time. In other RFA news, the Stars made the decision not to qualifying several other players who were in Texas at various points this season. Tom Wandell had already signed in the KHL and was not qualified. Tyler Beskorowany, Jace Coyle and Mathieu Tousignant did not receive offers and were not expected to. Finally, Dallas made the decision not to qualify Richard Bachman, who had a very bad 2012-13 season in Dallas, posting a sub-.900 save percentage and really not giving Kari Lehtonen enough of a break to keep the backup role. The Stars could sign a veteran backup for the NHL role and then allow that player to fight it out with Cristopher Nilstorp for the #2 spot behind Lehtonen. The Texas Stars announced today that the Dallas Stars, the club’s National Hockey League affiliate, has signed left wing Luke Gazdic to a one year contract for the 2013-14 season. Dallas also announced the signing of forward Lane MacDermid to a one year deal. Gazdic, 23, registered 11 points (4G-7A) and 80 penalty minutes in 59 regular season contests with Texas last season. The 6-foot-3, 240-pound forward tallied a season-high two assists and recorded a +2 plus/minus rating on Jan. 18 at Chicago and played in his 250th career American Hockey League game on April 6th vs. Hamilton. The Toronto, Ontario native appeared in eight games and had 19 penalty minutes for the Stars in the 2013 Calder Cup Playoffs, helping the team reach the Western Conference Semifinals. He has skated in 256 career AHL games, posting 447 penalty minutes and 55 points (27G-28A) in four seasons with Texas. Gazdic is the Stars’ all-time franchise leader in penalty minutes and holds single season team records for penalty minutes (155) and major penalties (21). He ranks fifth all-time on Texas in games played, 10th in goals and 14th in points. 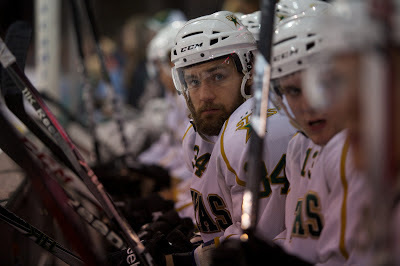 Gazdic is a member of the Original Texas Stars, one of eight players who have played every season of the team’s existence. He was Dallas’ sixth round selection (172nd overall) in the 2007 NHL Entry Draft. Any ideas on Benn, Baldwin, Cameron, Commodore, Fortunus, Hedden, Sloan, Sneep, Vause, and Wrenn? I've not noticed them mentioned recently. Benn has been offered an after Qualifying deal of 3 years the most of anyone so far besides Fraser who then got traded to Boston. the rest of those remained Unsigned.